We must think about where metals come from first, and they are mined from the earth in raw form called an ore. They could be a copper ore or an iron ore or some other ore. All ores come from the earth. Not all ores are equal either. For instance Lake Copper is almost in pure form when mined from the earth in an open pit mine in the Great Lakes Region of the United States of America. Most ores have impurities and these are almost impossible to remove 100% of the impurity; in some cases the impurity enhances the metals characteristics. After mining the ores are delivered to a steel mill except for some non-ferrous metals that use electro-chemical means to make the non-ferrous metal. Aluminum is an example. When the ore is delivered to the steel mill they are prepared by crushing and grinding to a smaller size to increase the surface area to the volume. Unfortunately, the ground iron ore must be sintered. Sintering is done be partial pre-cooking the iron ore in the presence of coke oven gases. The ore is now called sintered and this is used to charge the blast furnace. Now the sintered iron ore is prepared to be heated to a very-very high temperature where the ore melts in the presence of gases. Knowing what temperatures the components in the ore melt at is critical. Lets consider iron ore.
Iron ore's principal component in the mined rock is Fe2O3. This iron oxide also known as iron-oxide-III is plentiful enough to be commercially feasible to make steel. In the rock we will have small amounts of silica, sulfur and other undesirables. Some can be removed in the steel making process and others we tolerate. The second step, after mining and crushing the ore into manageable sizes is to make iron in the steel making process from the iron ore laden Fe2O3. We normally use a blast furnace to strip away the O3 (oxygen) in the Fe2O3 laden ore by adding a great amount of heat in the presences of coke, which is a pure form of carbon (C), and limestone (CaCO3) principally calcium carbonate. Limestone principally removes the silica from the iron ore in the steel making process. By using coke and limestone, which is heated to high temperatures with great amounts of compressed air in the presences of the iron ore we cause two-types of chemical reactions. We reduce the oxygen out of the iron ore and transform this oxygen by oxidation to (carbon dioxide) CO2. Stripping away O3 (oxygen) is called reducing. 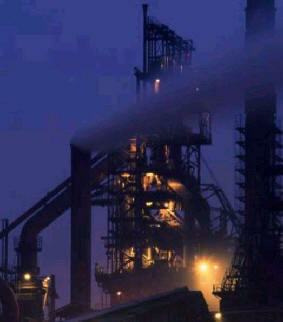 Most of the iron is produced in the blast furnace this way. But not all the iron coming out of the blast furnace is produced this way and some iron is made by the following steps. The iron is produced at temperatures of over 3,500oF and has carbon content when the iron leaves the blast furnace of greater than 4% to about 5%. This is similar to cast iron but not refined enough to be cast iron. Now the impurities must be removed in the form of slag, which floats on top of the molten (liquid) iron. Slag's principal component is calcium silicate or CaSiO3, which is where the impurity silica in the iron ore is made into to for removal from the steel making process. This is where the limestone does the work in the blast furnace. Remember, all these reactions are occurring at the same time in the furnace. Another impurity, which affects toughness that needs lowering from the iron is high amounts of sulfur/sulphur (S) and this is done by using magnesium (Mg). The Magnesium is blended in with the blast furnace charge. Now the slag can be drained from the top of the liquid iron, then the iron is drained from the bottom in to a special vehicle that can transport and hold the super hot iron liquid.